24:0.1 ON UVERSA WE divide all personalities and entities of the Conjoint Creator into three grand divisions: the Higher Personalities of the Infinite Spirit, the Messenger Hosts of Space, and the Ministering Spirits of Time, those spirit beings who are concerned with teaching and ministering to the will creatures of the ascendant scheme of mortal progression. 4. Personal Aids of the Infinite Spirit. 24:0.10 Solitary Messengers, Circuit Supervisors, Census Directors, and the Personal Aids are characterized by the possession of tremendous endowments of antigravity. The Solitary Messengers are without known general headquarters; they roam the universe of universes. The Universe Circuit Supervisors and the Census Directors maintain headquarters on the capitals of the superuniverses. The Personal Aids of the Infinite Spirit are stationed on the central Isle of Light. The Associate Inspectors and the Assigned Sentinels are respectively stationed on the capitals of the local universes and on the capitals of their component systems. The Graduate Guides are resident in the Havona universe and function on all its billion worlds. Most of these higher personalities have stations in the local universes, but they are not organically attached to the administrations of the evolutionary realms. 24:0.11 Of the seven classes composing this group, only the Solitary Messengers and perhaps the Personal Aids range the universe of universes. Solitary Messengers are encountered from Paradise outward: through the Havona circuits to the superuniverse capitals and thence out through the sectors and local universes, with their subdivisions, and even to the inhabited worlds. Although Solitary Messengers belong to the Higher Personalities of the Infinite Spirit, their origin, nature, and service have been discussed in the preceding paper. 24:1.1 The vast power currents of space and the circuits of spirit energy may seem to operate automatically; they may appear to function without let or hindrance, but such is not the case. All these stupendous systems of energy are under control; they are subject to intelligent supervision. Universe Circuit Supervisors are concerned, not with the realms of purely physical or material energy—the domain of the Universe Power Directors—but with the circuits of relative spiritual energy and with those modified circuits which are essential to the maintenance of both the highly developed spiritual beings and the morontia or transition type of intelligent creatures. The supervisors do not give origin to circuits of energy and superessence of divinity, but in general they have to do with all higher spirit circuits of time and eternity and with all relative spirit circuits concerned in the administration of the component parts of the grand universe. They direct and manipulate all such spirit-energy circuits outside the Isle of Paradise. 24:1.7 The supreme supervisors of Havona and the associate supervisors of the seven superuniverses are of completed numbers; no more of these orders are being created. 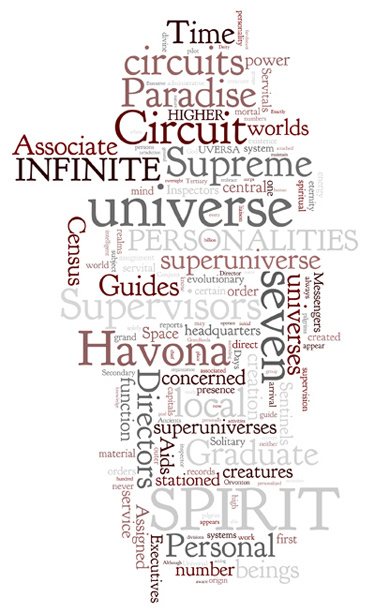 The supreme supervisors are seven in number and are stationed on the pilot worlds of the seven Havona circuits. The circuits of the seven superuniverses are in the charge of a marvelous group of seven associate supervisors, who maintain headquarters on the seven Paradise spheres of the Infinite Spirit, the worlds of the Seven Supreme Executives. From here they supervise and direct the circuits of the superuniverses of space. 24:1.8 On these Paradise spheres of the Spirit the seven associate circuit supervisors and the first order of the Supreme Power Centers effect a liaison which, under the direction of the Supreme Executives, results in the sub-Paradise co-ordination of all material and spiritual circuits passing out to the seven superuniverses. 24:1.9 On the headquarters worlds of each superuniverse are stationed the secondary supervisors for the local universes of time and space. The major and minor sectors are administrative divisions of the supergovernments but are not concerned in these matters of spirit-energy supervision. I do not know how many secondary circuit supervisors there are in the grand universe, but on Uversa there are 84,691 of these beings. Secondary supervisors are being created right along; from time to time they appear in groups of seventy on the worlds of the Supreme Executives. We obtain them on requisition as we arrange for the establishment of separate circuits of spirit energy and liaison power to the newly evolving universes of our jurisdiction. 24:1.10 A tertiary circuit supervisor functions on the headquarters world of every local universe. This order, like the secondary supervisors, is of continuous creation, being created in groups of seven hundred. They are assigned to the local universes by the Ancients of Days. 24:1.12 Whether acting in the local or higher universes, circuit supervisors direct all concerned as to the proper circuits to employ for the transmission of all spirit messages and for the transit of all personalities. In their work of circuit supervision these efficient beings utilize all agencies, forces, and personalities in the universe of universes. They employ the unrevealed “high spirit personalities of circuit control” and are ably assisted by numerous staffs composed of personalities of the Infinite Spirit. It is they who would isolate an evolutionary world if its Planetary Prince should rebel against the Universal Father and his vicegerent Son. They are able to throw any world out of certain universe circuits of the higher spiritual order, but they cannot annul the material currents of the power directors. 24:1.13 The Universe Circuit Supervisors have something of the same relationship to spirit circuits that the Universe Power Directors have to material circuits. The two orders are complemental, together having the oversight of all spirit and all material circuits that are controllable and manipulatable by creatures. 24:1.14 The circuit supervisors exercise certain oversight of those mind circuits which are spirit associated much as the power directors have certain jurisdiction over those phases of mind which are physical-energy associated—mechanical mind. In general the functions of each order are expanded by liaison with the other, but the circuits of pure mind are subject to the supervision of neither. Neither are the two orders co-ordinate; in all their manifold labors the Universe Circuit Supervisors are subject to the Seven Supreme Power Directors and their subordinates. 24:1.15 While the circuit supervisors are entirely alike within their respective orders, they are all distinct individuals. They are truly personal beings, but they possess a type of other-than-Father-endowed personality not encountered in any other type of creature in all universal existence. 24:1.16 Although you will recognize and know them as you journey inward towards Paradise, you will have no personal relations with them. They are circuit supervisors, and they attend strictly and efficiently to their business. They deal solely with those personalities and entities having the oversight of those activities which are concerned with the circuits subject to their supervision. 24:2.1 Notwithstanding that the cosmic mind of the Universal Intelligence is cognizant of the presence and whereabouts of all thinking creatures, there is operative in the universe of universes an independent method of keeping count of all will creatures. 24:2.2 The Census Directors are a special and completed creation of the Infinite Spirit, and they exist in numbers unknown to us. They are so created as to be able to maintain perfect synchrony with the reflectivity technique of the superuniverses, while at the same time they are personally sensitive and responsive to intelligent will. These directors, by a not-fully-understood technique, are made immediately aware of the birth of will in any part of the grand universe. They are, therefore, always competent to give us the number, nature, and whereabouts of all will creatures in any part of the central creation and the seven superuniverses. But they do not function on Paradise; there is no need for them there. On Paradise knowledge is inherent; the Deities know all things. 24:2.3 Seven Census Directors operate in Havona, one being stationed on the pilot world of each Havona circuit. Excepting these seven and the reserves of the order on the Paradise worlds of the Spirit, all Census Directors function under the jurisdiction of the Ancients of Days. 24:2.4 One Census Director presides at the headquarters of each superuniverse, while subject to such a chief director are thousands upon thousands, one on the capital of every local universe. All personalities of this order are equal excepting those on the Havona pilot worlds and the seven superuniverse chiefs. 24:2.5 In the seventh superuniverse there are one hundred thousand Census Directors. And this number consists entirely of those assignable to local universes; it does not include the personal staff of Usatia, the superuniverse chief of all Orvonton directors. Usatia, like the other superuniverse chiefs, is not directly attuned to the registration of intelligent will. He is solely attuned to his subordinates stationed in the Orvonton universes; thus he acts as a magnificent totaling personality for their reports coming in from the capitals of the local creations. 24:2.6 From time to time the official recorders of Uversa place on their records the status of the superuniverse as it is indicated by the registrations in and upon the personality of Usatia. Such census data is indigenous to the superuniverses; these reports are transmitted neither to Havona nor to Paradise. 24:2.7 The Census Directors are concerned with human beings—as with other will creatures—only to the extent of recording the fact of will function. They are not concerned with the records of your life and its doings; they are not in any sense recording personalities. The Census Director of Nebadon, number 81,412 of Orvonton, now stationed on Salvington, is at this very moment personally conscious and aware of your living presence here on Urantia; and he will afford the records confirmation of your death the moment you cease to function as a will creature. 24:2.8 Census Directors register the existence of a new will creature when the first act of will is performed; they indicate the death of a will creature when the last act of will takes place. The partial emergence of will observed in the reactions of certain of the higher animals does not belong to the domain of the Census Directors. They keep count of nothing but bona fide will creatures, and they are responsive to nothing but will function. Exactly how they register the function of will, we do not know. 24:2.9 These beings always have been, and always will be, Census Directors. They would be comparatively useless in any other division of universe labor. But they are infallible in function; they never default, neither do they falsify. And notwithstanding their marvelous powers and unbelievable prerogatives, they are persons; they have recognizable spirit presence and form. 24:3.1 We have no authentic knowledge as to the time or manner of the creation of the Personal Aids. Their number must be legion, but it is not of record on Uversa. From conservative deductions based on our knowledge of their work, I venture to estimate that their number extends high into the trillions. We hold the opinion that the Infinite Spirit is not limited as to numbers in the creation of these Personal Aids. 24:3.2 The Personal Aids of the Infinite Spirit exist for the exclusive assistance of the Paradise presence of the Third Person of Deity. Although attached directly to the Infinite Spirit and located on Paradise, they flash to and fro to the uttermost parts of creation. Wherever the circuits of the Conjoint Creator extend, there these Personal Aids may appear for the purpose of executing the bidding of the Infinite Spirit. They traverse space much as do the Solitary Messengers but are not persons in the sense that the messengers are. 24:3.3 The Personal Aids are all equal and identical; they disclose no differentiation of individuality. Though the Conjoint Actor looks upon them as true personalities, it is difficult for others to regard them as real persons; they do not manifest a spirit presence to other spirit beings. Paradise-origin beings are always aware of the proximity of these Aids; but we do not recognize a personality presence. The lack of such a presence-form undoubtedly renders them all the more serviceable to the Third Person of Deity. 24:3.4 Of all the revealed orders of spirit beings taking origin in the Infinite Spirit, the Personal Aids are about the only ones you will not encounter on your inward ascent to Paradise. 24:4.1 The Seven Supreme Executives, on the seven Paradise spheres of the Infinite Spirit, collectively function as the administrative board of supermanagers for the seven superuniverses. The Associate Inspectors are the personal embodiment of the authority of the Supreme Executives to the local universes of time and space. These high observers of the affairs of the local creations are the joint offspring of the Infinite Spirit and the Seven Master Spirits of Paradise. In the near times of eternity seven hundred thousand were personalized, and their reserve corps abides on Paradise. 24:4.2 Associate Inspectors work under the direct supervision of the Seven Supreme Executives, being their personal and powerful representatives to the local universes of time and space. An inspector is stationed on the headquarters sphere of each local creation and is a close associate of the resident Union of Days. 24:4.3 The Associate Inspectors receive reports and recommendations only from their subordinates, the Assigned Sentinels, stationed on the capitals of the local systems of inhabited worlds, while they make reports only to their immediate superior, the Supreme Executive of the superuniverse concerned. 24:5.1 The Assigned Sentinels are co-ordinating personalities and liaison representatives of the Seven Supreme Executives. They were personalized on Paradise by the Infinite Spirit and were created for the specific purposes of their assignment. They are of stationary numbers, and there are exactly seven billion in existence. 24:5.2 Much as an Associate Inspector represents the Seven Supreme Executives to a whole local universe, so in each of the ten thousand systems of that local creation there is an Assigned Sentinel, who acts as the direct representative of the far-distant and supreme board of supercontrol for the affairs of all seven superuniverses. The sentinels on duty in the local system governments of Orvonton are acting under the direct authority of Supreme Executive Number Seven, the co-ordinator of the seventh superuniverse. But in their administrative organization all sentinels commissioned in a local universe are subordinate to the Associate Inspector stationed at universe headquarters. 24:5.3 Within a local creation the Assigned Sentinels serve in rotation, being transferred from system to system. They are usually changed every millennium of local universe time. They are among the highest ranking personalities stationed on a system capital, but they never participate in deliberations concerned with system affairs. In the local systems they serve as the ex officio heads of the four and twenty administrators hailing from the evolutionary worlds, but otherwise, ascending mortals have little contact with them. The sentinels are almost exclusively concerned in keeping the Associate Inspector of their universe fully informed on all matters relating to the welfare and state of the systems of their assignment. 24:5.4 Assigned Sentinels and Associate Inspectors do not report to the Supreme Executives through a superuniverse headquarters. They are responsible solely to the Supreme Executive of the superuniverse concerned; their activities are distinct from the administration of the Ancients of Days. 24:5.5 The Supreme Executives, Associate Inspectors, and Assigned Sentinels, together with the omniaphim and a host of unrevealed personalities, constitute an efficient, direct, centralized, but far-flung system of advisory and administrative co-ordination of all the grand universe of things and beings. 24:6.1 The Graduate Guides, as a group, sponsor and conduct the high university of technical instruction and spiritual training which is so essential to mortal attainment of the goal of the ages: God, rest, and then eternity of perfected service. These highly personal beings take their name from the nature and purpose of their work. They are exclusively devoted to the tasks of guiding the mortal graduates from the superuniverses of time through the Havona course of instruction and training which serves to prepare the ascending pilgrims for admission to Paradise and the Corps of the Finality. 24:6.2 I am not forbidden to undertake to tell you of the work of these Graduate Guides, but it is so ultraspiritual that I despair of being able to adequately portray to the material mind a concept of their manifold activities. On the mansion worlds, after your vision range is extended and you are freed from the fetters of material comparisons, you can begin to comprehend the meaning of those realities which “eye cannot see nor ear hear, and which have never entered the concept of human minds,” even those things which “God has prepared for those who love such eternal verities.” You are not always to be so limited in the range of your vision and spiritual comprehension. 24:6.3 The Graduate Guides are engaged in piloting the pilgrims of time through the seven circuits of Havona worlds. The guide who greets you upon your arrival on the receiving world of the outer Havona circuit will remain with you throughout your entire career on the heavenly circuits. Though you will associate with countless other personalities during your sojourn on a billion worlds, your Graduate Guide will follow you to the end of your Havona progression and will witness your entrance into the terminal slumber of time, the sleep of eternity transit to the Paradise goal, where, upon awakening, you will be greeted by the Paradise Companion assigned to welcome you and perhaps to remain with you until you are initiated as a member of the Mortal Corps of the Finality. 24:6.4 The number of Graduate Guides is beyond the power of human minds to grasp, and they continue to appear. Their origin is something of a mystery. They have not existed from eternity; they mysteriously appear as they are needed. There is no record of a Graduate Guide in all the realms of the central universe until that far-distant day when the first mortal pilgrim of all time made his way to the outer belt of the central creation. The instant he arrived on the pilot world of the outer circuit, he was met with friendly greetings by Malvorian, the first of the Graduate Guides and now the chief of their supreme council and the director of their vast educational organization. 24:6.7 At that far-distant time I was attached to the service of the Ancients of Days on Uversa, and we all rejoiced in the assurance that, eventually, pilgrims from our superuniverse would reach Havona. For ages we had been taught that the evolutionary creatures of space would attain Paradise, and the thrill of all time swept through the heavenly courts when the first pilgrim actually arrived. 24:6.8 The name of this pilgrim discoverer of Havona is Grandfanda, and he hailed from planet 341 of system 84 in constellation 62 of local universe 1,131 situated in superuniverse number one. His arrival was the signal for the establishment of the broadcast service of the universe of universes. Theretofore only the broadcasts of the superuniverses and the local universes had been in operation, but the announcement of the arrival of Grandfanda at the portals of Havona signalized the inauguration of the “space reports of glory,” so named because the initial universe broadcast reported the Havona arrival of the first of the evolutionary beings to attain entrance upon the goal of ascendant existence. 24:6.9 Graduate Guides never leave the Havona worlds; they are dedicated to the service of the graduate pilgrims of time and space. And you will sometime meet these noble beings face to face if you do not reject the certain and all-perfected plan designed to effect your survival and ascension. 24:7.1 Though evolution is not the order of the central universe, we believe that the Graduate Guides are the perfected or more experienced members of another order of central universe creatures, the Havona Servitals. Graduate Guides show such a breadth of sympathy and such a capacity for understanding the ascendant creatures that we are convinced they have gained this culture by actual service in the superuniverse realms as the Havona Servitals of universal ministry. If this view is not correct, how then can we account for the continuous disappearance of the senior or more experienced servitals? 24:7.2 A servital will be long absent from Havona on superuniverse assignment, having been on many such missions previously, will return home, be granted the privilege of “personal contact” with the Paradise Central Shining, will be embraced by the Luminous Persons, and disappear from the recognition of his spirit fellows, never more to reappear among those of his kind. 24:7.3 On returning from superuniverse service, a Havona Servital may enjoy numerous divine embraces and emerge therefrom merely an exalted servital. Experiencing the luminous embrace does not necessarily signify that the servital must translate into a Graduate Guide, but almost one quarter of those who achieve the divine embrace never return to the service of the realms. 24:7.6 When such an entry appears on the records, the career of such a servital is closed. But in just three moments (a little less than three days of your time) a newborn Graduate Guide “spontaneously” appears on the outer circuit of the Havona universe. And the number of Graduate Guides, allowing for a slight difference, due no doubt to those in transition, exactly equals the number of vanished servitals. 24:7.7 There is an additional reason for supposing the Graduate Guides to be evolved Havona Servitals, and that is the unfailing tendency of these guides and their associated servitals to form such extraordinary attachments. The manner in which these supposedly separate orders of beings understand and sympathize with one another is wholly inexplicable. It is refreshing and inspiring to witness their mutual devotion. 24:7.8 The Seven Master Spirits and the associated Seven Supreme Power Directors, respectively, are the personal repositories of the mind potential and of the power potential of the Supreme Being which he does not, as yet, operate personally. And when these Paradise associates collaborate to create the Havona Servitals, the latter are inherently involved in certain phases of Supremacy. Havona Servitals are thus, in actuality, a reflection in the perfect central universe of certain evolutionary potentialities of the time-space domains, all of which is disclosed when a servital undergoes transformation and re-creation. We believe that this transformation takes place in response to the will of the Infinite Spirit, undoubtedly acting in behalf of the Supreme. Graduate Guides are not created by the Supreme Being, but we all conjecture that experiential Deity is in some way concerned in those transactions which bring these beings into existence. 24:7.9 The Havona now traversed by ascending mortals differs in many respects from the central universe as it was before the times of Grandfanda. The arrival of mortal ascenders on the Havona circuits inaugurated sweeping modifications in the organization of the central and divine creation, modifications undoubtedly initiated by the Supreme Being—the God of evolutionary creatures—in response to the arrival of the first of his experiential children from the seven superuniverses. The appearance of the Graduate Guides, together with the creation of the tertiary supernaphim, is indicative of these performances of God the Supreme.